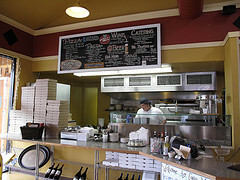 Casa Mia a photo by Gexydaf on Flickr. Today our family was celebrating and we decided to try a new to us restaurant, Casa Mia Italian Restaurant at 7304 Lakewood Drive, Suite 1, Lakewood, WA 98499. We’ve been looking for a local Italian restaurant that is more than a pizza place, but won’t break the budget. Casa Mia was just what we wanted. We had Rosemary Chicken Ravioli, Manacotti and a submarine sandwich. All three were delicious and the service was fast and friendly. I’ll have to try a pizza sometime soon. The chicken pizza with three cheeses looks particularly tempting! 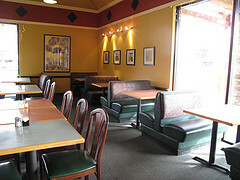 Casa Mia Italian Restaurant is a chain of eight (Lakewood, Yelm, Olympia, Hoquiam, Kennewick, Lacey, Puyallup and Richland). The first of them opened in 1952 in Hoquiam. This entry was posted in Lakewood, Restaurants, Sit Down Establishments, WA State - Pierce County and tagged Casa Mia, Italian, Lakewood, Manacotti, restaurant, Rosemary Chicken Ravioli, submarine sandwich on March 6, 2011 by admin.